Bristol's first mobile enforcement car has taken to the roads to catch drivers who park illegally outside the city's schools, hospitals and taxi ranks. The £36,000 vehicle, which will be in action seven-days-a-week, is armed with a camera which will also snap people who park on bus stops and loading bays. 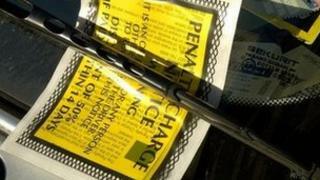 Civil enforcement officers will issue warnings for the first two weeks, with fines being introduced from 30 January. The penalty for illegal parking is £70, reduced to £35 if paid within 21 days. "The camera will pick up anybody contravening [the] traffic regulations that we've programmed into the system and I simply have to drive it around," said civil enforcement officer Tony Jones. "It matches it against the global positioning system and time of the restriction and, if necessary, then it'll capture an image. "It'll go through the system, be manually checked to make sure it's all correct and the contravening person will receive a penalty charge notice in the post." The car will operate from 07:00 GMT to 22:00 GMT from Monday to Saturday, and 09:00 GMT to 17:00 GMT on Sunday. "If you've got someone stopped at a bus stop, it might only be for a couple of seconds but the bus then parks in the middle of the road and people can't get off," said Dr Jon Rogers, Liberal Democrat executive member at Bristol City Council. "This is the enforcement of the lines where there is no stopping and, even if you have your car running, it's not acceptable and they will get the fine," he added.